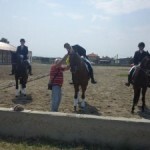 Bulgarian senior team won silver medal on the first day of the Balkan Dressage Championship. Raiko and Amber contributed to the success with their strong performance and high marks awarded by the judges. They also took 5th place in Senior Individual Intermediate 1 and qualified for the medal deciding Freestyle. They need to be greeted for their spectacular performance, even though they could not reach the top three on the finals. This year Bulgarian athletes won 5 medals – the best achievement our riders have accomplished in the last 5 years. 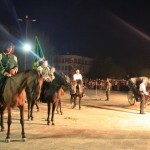 Bulgarian senior’s team claimed the silver, whereas Greece took the gold and Turkey took the bronze. In addition to the silver, our children’s team became Balkan Champion, followed by the teams of Turkey and Serbia. Bulgarian team also took second place in the junior class. Individual medals were awarded to Iva Todorova, who claimed silver in the Children’s Individual Championship, and Yana Zafirova, who took bronze medal in the Senior Individual Championship. Rien van der Schaft, the world- famous dressage trainer, who worked with Bulgarian riders in the last three months, undoubtedly had a great contribution to their success. The Bulgarian hosts of the Balkan Dressage Championships, staged at the Equestrian Centre in Yagodovo, welcomed 6 visiting nations- Greece, Turkey, Serbia, Romania, Moldova and Estonia, with 39 horses.